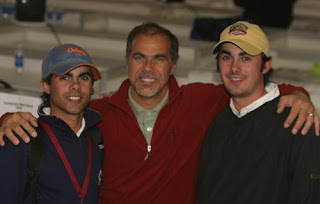 Tom Auclair with sons Kyle and T.J. Inside the Ropes.com founder Tom Auclair is a man on a mission! Dubbed "the Ironman" by many on the PGA Tour, Tom has faithfully delivered to his viewers and fans unique candid video interviews of some of the world's best golfers inside the ropes style for over a decade! His sons Kyle, a PGA Tour photog and T.J., an interactive producer for Turner Sports have joined forces with their father over the years to create (as I once heard it put while attending a PGA tour event by a source who shall remain nameless) a sort of PGA Tour Media Mafia! Whatever they're called out there on the road, these 3 Musketeers have got it goin' on for sure! A former professional skier, Tom started out in radio - his show syndicated worldwide to over 1,000 stations. I still say he's the pioneer of what is referred to as the social media/vlogging/blogging sports media of today! Tom's got that techie geek thirst for speed and an entrepreneurial spirit which bodes well for his multi-media empire! Stay tuned cause Tom's got many more tricks up his sleeve in regard to the hottest information technologies and social media yet to hit the market!